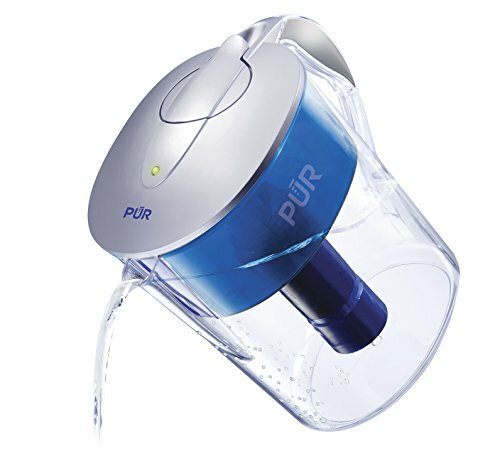 The water filter pitcher produced by PUR comes at a surprisingly low price for its water filtering capabilities. This model is better than most at removing mercury and pharmaceutical traces from your drinking water. This is a very good water filter and it comes at a surprisingly low price. The water filter pitcher can hold up to 11 glasses of water. The filter is constructed using only BPA free materials. All the components used for this filter are food grated, so it’s safe to wash and use them again. This provides an environmentally-friendly option to using plastic water bottles. One of the advantages of using this water filter pitcher is its effectiveness. This pitcher uses a cartridge filter that is able to remove most of the contaminants in your water source. Not only that, but the premium carbon filter is able to remove up to 95% of the mercury in the water, up to 96% of the pharmaceuticals, and even heavy metals. The activated carbon filter is made out of heat treated coconut shells, which have a relative adsorption surface of 200,000 square feet. People who buy pitcher water filters don’t expect them to remove any special contaminants, just the usual ones like chlorine, debris, and bad taste. This model, however, goes the extra mile and removes a good deal more. The cartridge filters used by this pitcher filter use a basic 3-step filtration technology. As soon as the water enters the filter, it passes through a tight mesh. The mesh will block the larger contaminants from going forward, making sure they won’t reach your drinking water. After the water passes through the mesh, it goes into an activated carbon filter. This filter is made out of coconut shells, and it has a very porous surface. Even though it might seem small, a grain of treated carbon can offer up to 1,000 square meters of the porous surface. The contaminants in the water are attracted to the carbon through a natural phenomenon called adsorption, so they will enter its porous surface instead of remaining in the water. After that, the water goes through an ion-exchange filter. This filter will remove the minerals responsible for limescale buildups. These minerals are represented by magnesium and calcium. When they enter the ion-exchange filter, they get trapped by the resin beads, removing them from the water. The resulting water will be cleaner, softer, and better tasting. Of course, drinking this water is healthier than drinking normal tap water, but it can even be healthier than drinking bottled mineral water. The cartridge filters used by this water pitcher filter have a maximum filtering capacity of 40 gallons. This is not a high filtering capacity, so you will need to change the filters more often than those of other models. This might be an inconvenience for some people, even if the changing the filters won’t take too long. With a top filtering capacity of 40 gallons, you might have to change the filters once every 4 – 6 weeks, depending on your water consumption. The pitcher has a maximum capacity of 11 cups or 0.68 gallons. However, the filtered water capacity is only 8 cups or 0.5 gallons. Depending on your household’s water consumption, you might have to refill the pitcher multiple times every day. The water filter pitcher has a good ergonomic design, so you will be able to handle and store it with ease. The pitcher is very easy to fill, and it pours without spilling the water. Filters Out Mercury And Pharmaceuticals – This filter is better than others at removing these substances, so it would be a safe choice if you have them in your water. BPA-free Plastic – All the components that come in contact with the water are made out of BPA-free plastic. This is an advantage as it allows you to use the filter for a long time without risking for the plastic to leak into your drinking water. Efficient Filtration – Even though this water filter doesn’t work fast, it’s capable of providing high-quality water. Most of the contaminants in the water will be removed by the time it enters the pitcher. Slow Filling Time – The filter takes a long time to fill, sometimes up to a whole hour. The pitcher filter has a slow filling time to start with, and it only goes slower as the filter approaches its maximum filtration capacity. LED Might Not Work – This model relies on a LED light to notify you when it’s time to change the filters. Some customers complained that the LED didn’t work when they received the unit. Could Soften More – The ion-exchange filter used for softening the water could be better. Even though the water is noticeably softer when it’s filtered, it will still leave some deposits.